Joshua starts work at a law firm without realising what he's getting himself in for; by Matthew Harrison. Joshua was anxious. It was his third day in Melton's litigation department, but he had nothing to do. And he had worried about having too much! Maybe the lawyerly life was easier than he had thought - although his father, a partner in another firm, was always in the office. Joshua's mother had suggested smiling at his supervisor, but the mahogany door seemed always closed. "It's rather relaxed here," he remarked to his buddy Sam. "What did you expect?" Sam said, leaning over his desk. Sam was always impeccably dressed, his shirts crisply ironed, his blond hair slicked back, although his eyes were a little glassy. "I thought I'd be given work right away. What should I do?" "Don't worry about it!" Sam laughed. "You'll be remembering this moment," he said, chortling as he returned to his cubicle. Still uneasy, Joshua logged on the firm's intranet, then checked the football scores, and texted his girlfriend Susan. He even dared email his supervisor, but no reply. His neighbours were busy, though, and when in desperation Joshua took a walk along the firm's corridors, he found that it was the same in every mahogany-panelled corner of the office. As he passed meeting rooms, he heard the muffled sound of negotiation through the frosted glass doors. Everyone was working except him. Even Rita the receptionist, who on his first day had had a kindly word, was besieged by visitors. Joshua stumped back to his cubicle, and checked his watch. Six o'clock came. Joshua was sadly packing his bag when suddenly his supervisor's door opened. A sandy head appeared - the kind that barely shows the grey - and tortoiseshell glasses scanned the aisle. Then, miraculously, the glasses focused on Joshua. He was beckoned into the office, given a file of papers, and ushered out again with a curt, "Tomorrow morning." Well! Joshua was delighted. Riffling through the papers, he found the references and soon located the file on the intranet. It was an affidavit. Recalling his studies, and drawing on examples from the Temple Bar, Joshua set to with relish. He remembered to call his mother, and over the phone heard her sigh of relief. "Your father will be so pleased!" Susan was just as enthusiastic, while Sam urged him to,"Hit the rubber!" Not quite sure what that meant, Joshua found the data room and started opening files. Swept up in the joy of the chase, he spotted key points and worked them into the affidavit; the adrenaline rush carried him into the small hours. It was not until he began to flag that he noticed that the cubicles in the darkened office were still occupied, each with its little halo of light. No one else had gone home. Bleary-eyed but happy, Joshua handed in the draft affidavit to the partner the following morning. He had missed a night's sleep, but it was worth it - he had met the deadline. Sam had already texted him a 'Congrats!'. Joshua leant back in his cubicle and yawned. Wow, he was tired! But life was looking good. He was just about to go home for a shower, when the partner's door opened again. Joshua hurried over, but instead of the expected praise, he received a new assignment - discovery in another case. "Tomorrow morning, please," the partner said, leaving the door open as he began a loud conference call. Joshua stood shoulders slumped. Never had he worked through the night before, and here he was, no thanks, only more work to come. Feeling sorry for himself, he trudged back and opened up the respective data room. A vast library of documents appeared. A friendly hand patted his shoulder. It was Sam. "I'll have to work through the night again," Joshua groaned. "What a pain! And I need a shower." "That I can help with," said Sam. His buddy led a surprised Joshua to a particular frosted glass door, behind which there were indeed showers, steaming from the previous occupant. After showering, Joshua felt better. "I suppose people often work late here?" he asked Sam. "Not exactly," Sam said. A frown appeared below the slicked-back hair, then his face became as smooth again. "It's more that they never go home." As Joshua reported to Susan in a hurried call, this was true. Surfacing now and then from his forays in the data room, he observed colleagues in the nearby cubicles. They worked all morning, sometimes attending meetings. At lunchtime they disappeared for short while, to return with a sandwich or a lunchbox which they ate in front of the screen. The only real break seemed to come around five when as if by general agreement people got up and chatted. Then just as suddenly they all stopped and returned to their desks. The evening drew on, darkness fell outside, the overhead lighting switched off and dimness settled over the office. But at each desk a lamp illuminated its dogged occupant. By one am, Joshua was scrolling through the documents like an automaton. A heavy weight pressed on his head, he couldn't see the screen, he had to stop. Stumbling over to Sam, he groaned, "Oh God! Surely people must sleep? They can't just go on and on." "Perhaps you can't," was the response. Stung, Joshua returned to his desk. He wouldn't be beaten. The adrenaline was flowing again, and he felt surprisingly fresh. Opening the files, he quickly found the trail, and gave himself to the chase. Hours passed. Only the phone ringing in a neighbour's cubicle brought him back to the present. By now, the adrenaline had ebbed. His face felt stretched, his eyes swollen. Rosy light was coming through the windows, colleagues were stretching, the enticing smell of coffee wafted across. Joshua felt ravenous. He started up to get food. But the work wasn't finished. Grimly, Joshua sat down again. His empty stomach boiling, he retrieved the last few files. Then he printed out the report and staggered over to the partner's secretary. Now surely he could eat, and rest. But the secretary refused to accept the report, the format was not right. Almost fainting, Joshua went back to his desk. He was working through the reformatting when with an irresistible aroma a steaming cup was set on his desk. "Thought you'd need it," said Sam. 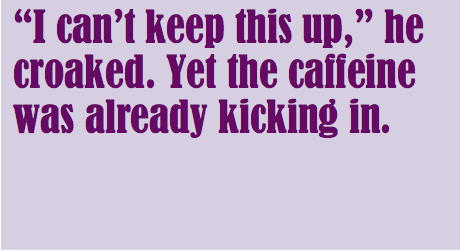 Gratefully, Joshua gulped at the coffee, scalded his throat, sipped again. "I can't keep this up," he croaked. Yet the caffeine was already kicking in. "But it isn't human!" Joshua protested. "Two nights without sleep. I can't go on." 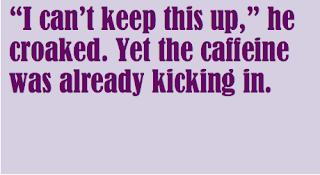 With the coffee, though, he found strength. This time he emailed the report to the partner directly, not even copying the secretary. Done! Now he would sit back and rest. He shut his eyes. But wait - his inbox! Hurriedly, he checked: there were dozens of messages, some stamped 'Urgent!' - and these were from the partner! Joshua opened these mails and set to work. He forgot to eat or drink; only the gnawing pain in his stomach made him at last tear his eyes away from the screen. And then he remembered Susan. He grabbed his phone, tapped in the password with trembling fingers, and found forty messages. Oh no! Rita smiled at Joshua as he hurried past, but already apologising on the phone to Susan he had no time to chat. Grabbing a couple of sandwiches from a nearby shop he rushed back, still apologising. Then when he reached his desk, he opened the emails. New mails were coming in all the time, he was barely treading water. Adrenaline pumping again, he worked flat out until the late afternoon. Then flow of emails began to subside and he joined the others in the communal break. Returning, Joshua slumped in his seat, totally drained. Three days and two nights! He had to sleep, he had to. He closed his eyes. Still came the 'ding... ding' of emails landing in his inbox. He silenced the alert and closed his eyes again. But he was trembling and stressed, he just could not relax. "I'm dying," Joshua whispered as Sam came by. His tongue felt thick, his ears were ringing, the mahogany panels were out of focus. "I really have to go sleep. I can't face another night." "Are you sure?" Sam said, pulling up a chair. He looked fresh, his shirts as clean-pressed as ever. "Sam, I can't," Joshua croaked. "I-I have to resign." Tears of self-pity welled up; he buried his face in his hands. "I've tried, God knows." "You're not alone, Josh," Sam said gently. "We've all been there." His buddy's words percolated down into Joshua's brain, registered, demanded a response. "How do you do it?" he said at last. "Did you go home last night?" "The night before?" Another shake. "Ever?" Joshua was so dazed that this hardly seemed surprising any more. "You mean... you never go home?" he said, hardly able to articulate the words. Sam smiled. "You can't do it on adrenaline, Josh. Look at you!" he spread his hands: "You're a wreck!" Joshua indeed felt a wreck, while Sam looked as smart as ever. "How do you manage?" His buddy fingered his shirt. "There's a laundry service," he said. "Take-aways. The firm is quite thoughtful..."
"And my girlfriend!" Joshua cried. He wanted to bury himself in Susan's embrace right then. "Well, I'm not supposed to tell you this," Sam began, "but since you're a pal..." He bent in to whisper. "Conjugal visits?" Joshua repeated blankly. Rousing himself for a final effort, he spoke thickly through the fog that seemed to envelop him. "How do you manage without sleep?" Sam put a reassuring hand on Joshua's arm. "We don't." Almost hallucinating with exhaustion, Joshua goggled. "Let me show you," Sam said. One month later, just after the afternoon break, Joshua was rounding up a set of drafting instructions, feeling pleased with himself. He had completed the affidavit, the discovery, and several other assignments. Tortoiseshell even smiled when they met. Joshua's inbox was bursting with further tasks, but that was good, he could handle them. He sat back and reflected on his first month at Melton's. During the whole time he had returned home just twice, to pick up more clothes to supplement his office wardrobe. His mother anxiously asked after his health, but his robust appearance obviously impressed her and she eventually let him go. His father patted him on the back: "Knew you could do it, my boy." The conjugal visits thing was working out too: he and Susan were getting on just fine. Enough! Joshua knew he had to get back to work. But he was at that moment feeling tired. So he shut off his monitor and leant back in his chair. Now came the best part of the day - and it happened several times a day. Slowly, deliberately, as Sam had taught, he closed his eyes and held them closed. His racing thoughts slowed and for one delicious instant his mind became still. There was a moment without time. Though unconscious, Joshua felt his head loll onto his shoulders. Then he awoke, refreshed. And blinked. That’s a very effective meditation technique whatever it is! A fun read. I think my blood pressure spiked reading this! I don't care what kind of meditation would keep me up and productive, the idea of a life where a few hours on a Friday night is considered unwinding is my greatest fear. Thanks for putting this together Matthew I really enjoyed it! Enjoyable read. We do seem to rise to the demands of our work...even to our own detriment. See it all the time, though not to this degree.